Adorable, cheap, and easy way to create glow in the dark nail polish! Crack your glow stick until it cannot crack anymore. Then, take the glow stick and cut the bottom and top with scissors. Each cut should be about a centimeter away from the tips of the stick. Quickly place the glow stick over the opened bottle of clear nail polish, and let the juices leak out until the glow stick is empty. If the juices aren't coming out of the glow stick well enough, you can blow on the top of it. Make sure the juices don't get on your lips though. Put on cap, Shake, and apply to nails! i love this! but how long does it actually last for? I wanted to make some up tonight to wear in three days time, but i dont want to waste a bottle of nail polish for something that i wont get to use! did you even try this yourself? Woah!! You're evil in a gud way!! Luckily my dollar tree had some glow in the dark nail polish, so I'll have to give this a try when I run out of that stuff I looooove glow in the dark nail polish. 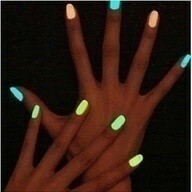 i tried this, mixing 2 glow sticks, and i got 0 glow. I found cheap glow-in-the-dark nail polish at walmart around halloween. I think it was under $5 & ive had it for 3 yrs & it still works.